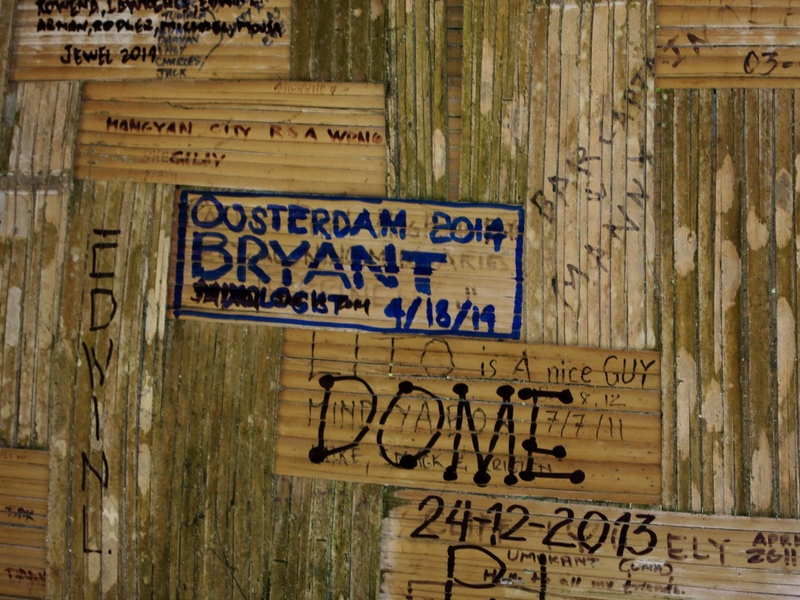 I'd heard about this island, and was not all that enthusiastic about going ashore. I'd been under the misgiving that it was just a 'Disney-fied' destination, purely there for the benefit of the cruise-line operators. Some of that may be true, but the sun was shining, the sand was soft and clean, and the waters crystal clear. The good ship 'Oogivesadam' ! It's a very small island, only about two kilometres in length and maybe 500 metres wide. YM and I walked the whole way around it in about 30 minutes. 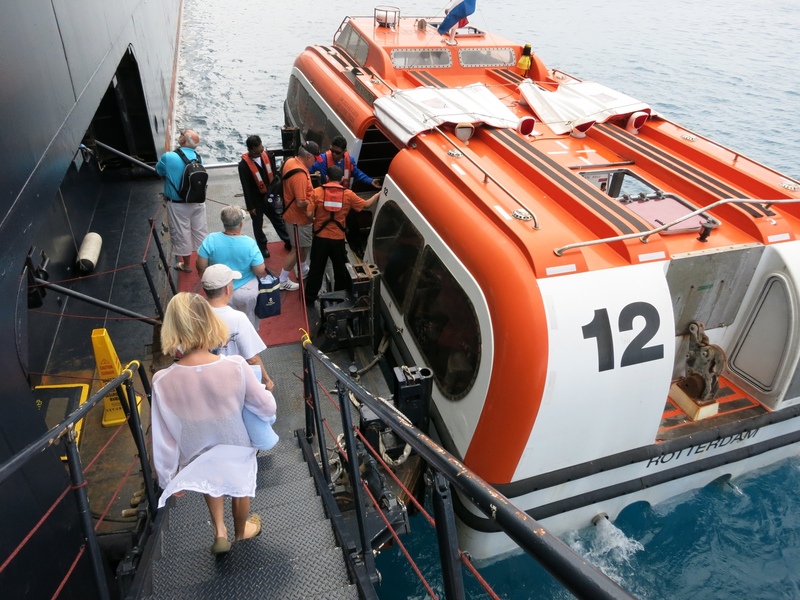 Amazingly, with 1700 passengers and quite a few crew ashore at the same time, it didn't feel crowded ( especially the further away from the 'jetty' you got.) 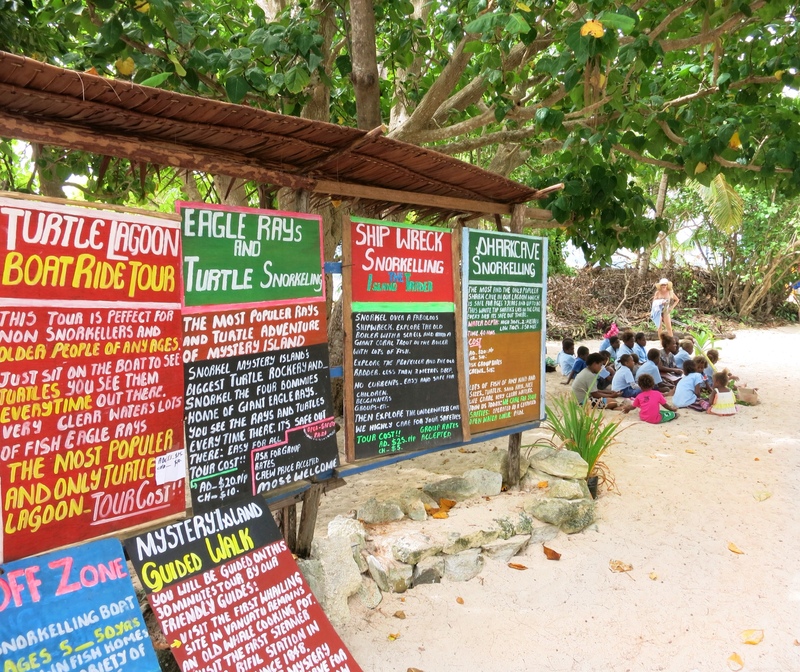 Although uninhabited, the locals come over from a neigboring island and set up a marketplace etc, and HAL send some crew ashore with enough provisions to set up a typical beach-bar. 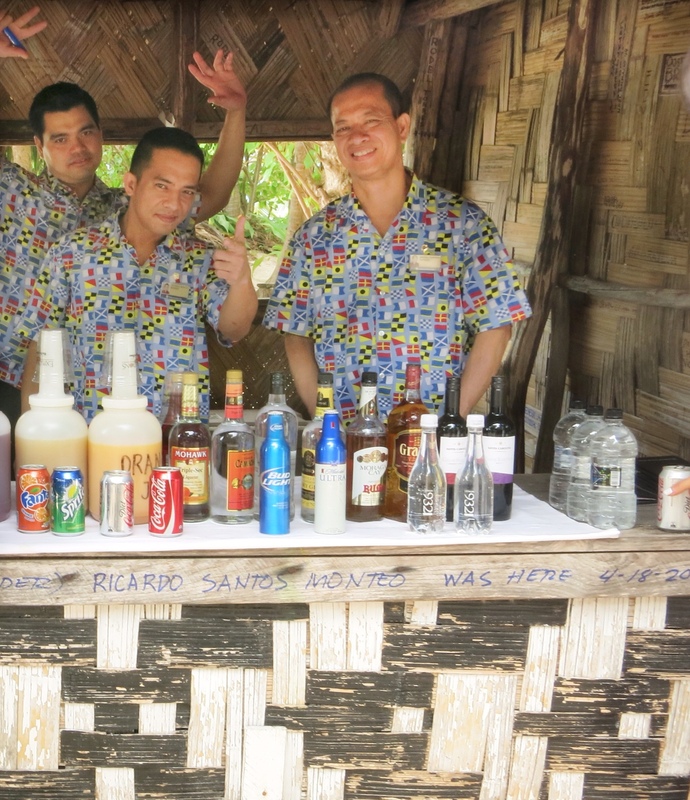 The 'Mystery Bar' on Mystery Island. It was here that I dicovered that not all American beer is so bad, after all. As choice was very limited, I tried a 'Michelob Ultra' in a pint size ( US pint, not Imperial pint, but still good size) aluminium container, and apart from being very cold and easy to drink from, it's the same price as a 335 ml bottle but you get 475 ml…as an added bonus it is also tasty…..and contains 5% Alcohol…..what's not to like? After getting re-hydrated ( did I mention it's quite hot) we continued our stroll into the 'interior'…. I heard the sound of music coming from somewhere…. ' Country Roads' the John Denver song, and in a clearing we came across a group of school kids, one playing a guitar, and the rest singing along….. all trying to raise money for their primary school. After listening for a while to an eclectic choice of songs, ('My Bonnie lies over the Ocean', 'Twinkle Twinkle Little Star', 'Are you Lonesome Tonight' ???) 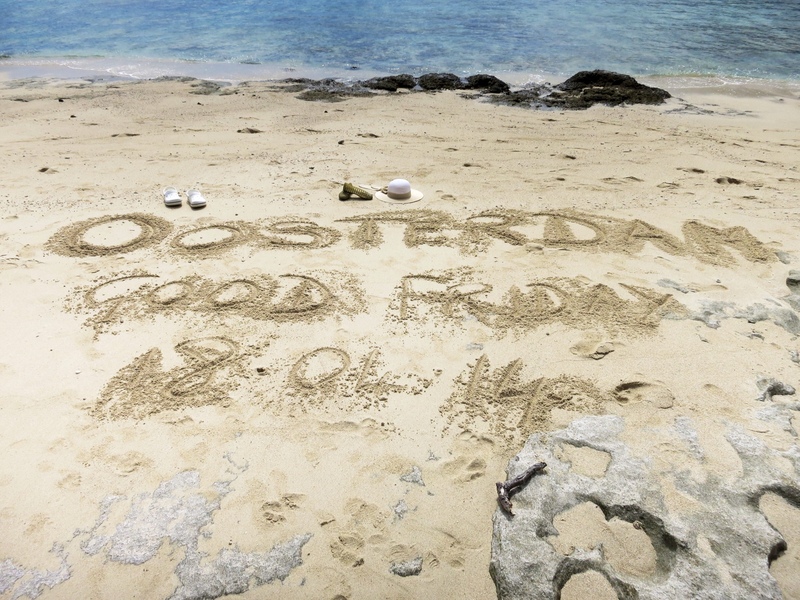 we left a donation of the remainder of our New Caledonia Francs and some VD's ( Vanuatu Dollars). 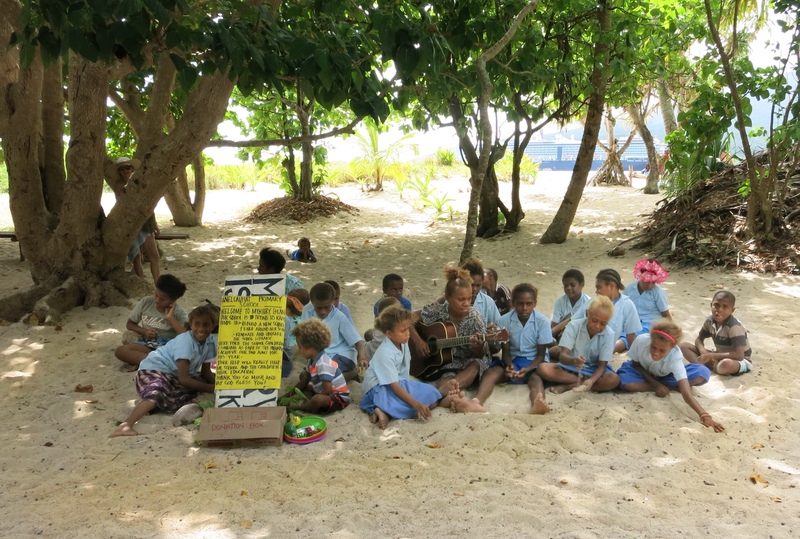 Kids from Anelcauhat Primary School raising funds by singing. The Marketplace on the island contained the usual mix of tee-shirts, Muu-Muu's, shells, tacky plastic souvenirs 'Made in China' etc. 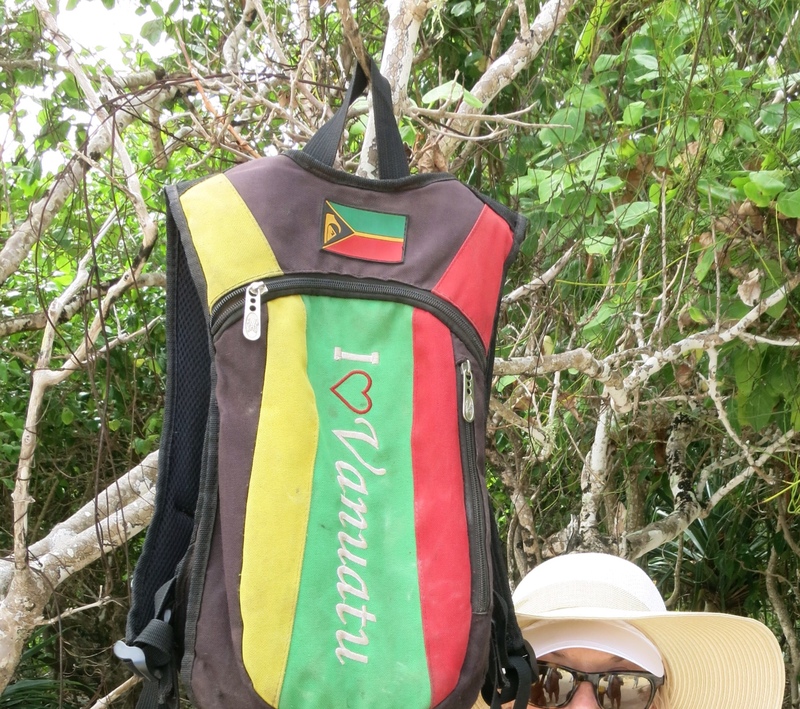 YM bought a Vanuatu flag, as a gift for a 'friend' who collects them… (any flags, not just Vanuatu ones) and I almost bought a stubby holder….. 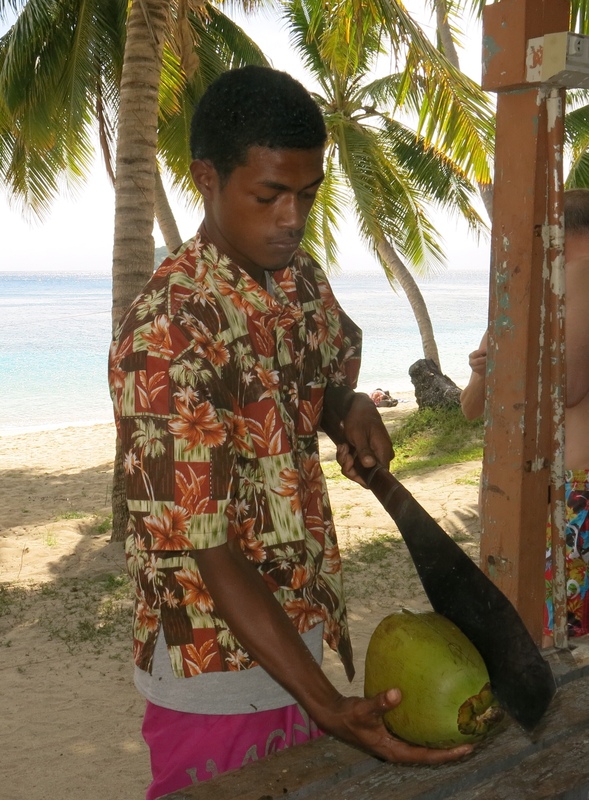 The young guy chopping the coconuts had obviously never heard of OHaS regulations, as he held the 'nut' in the palm of his hand and gave it a swift 'chop' with his machette…. dont try this at home folks!!! 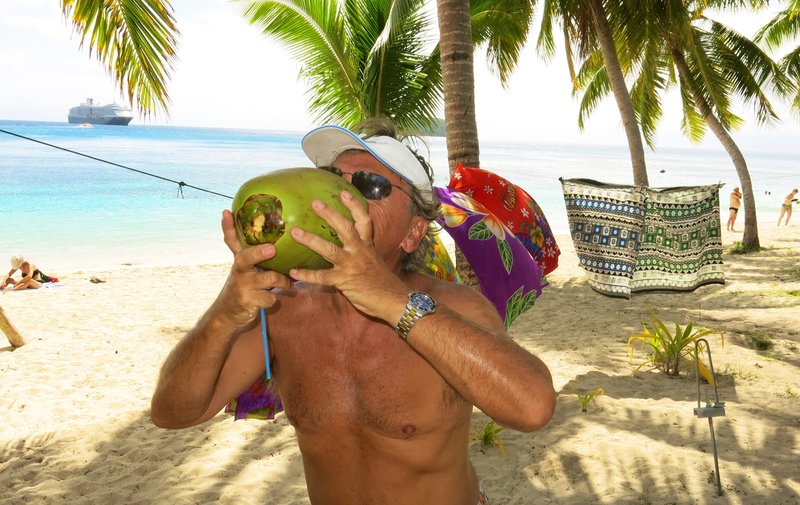 Mmmmm….DEE-LISH-US…… all that's missing is Harry Belafonte singing 'Coconut Water' in the background.. maybe I could request the school kids to come by and sing it for me. I wonder how long before the promised effects 'kick in' ? 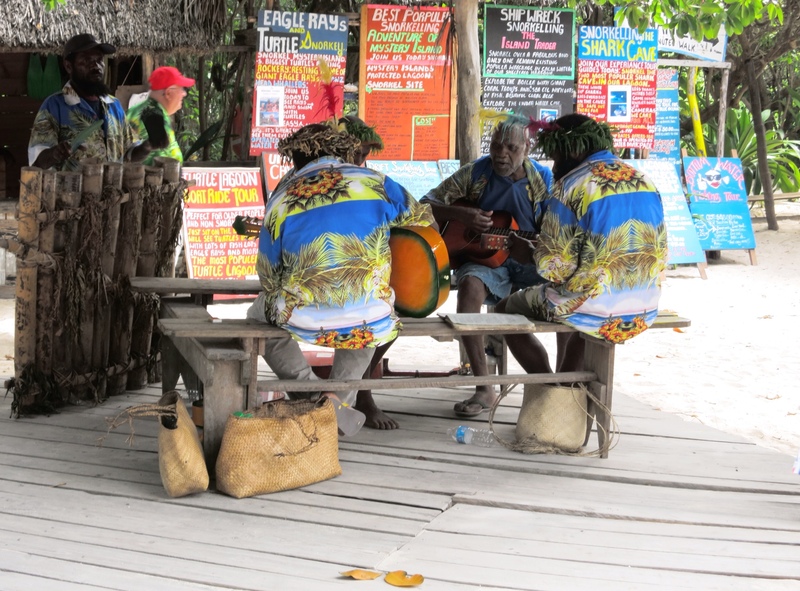 Yep, I LOVE Vanuatu too…. 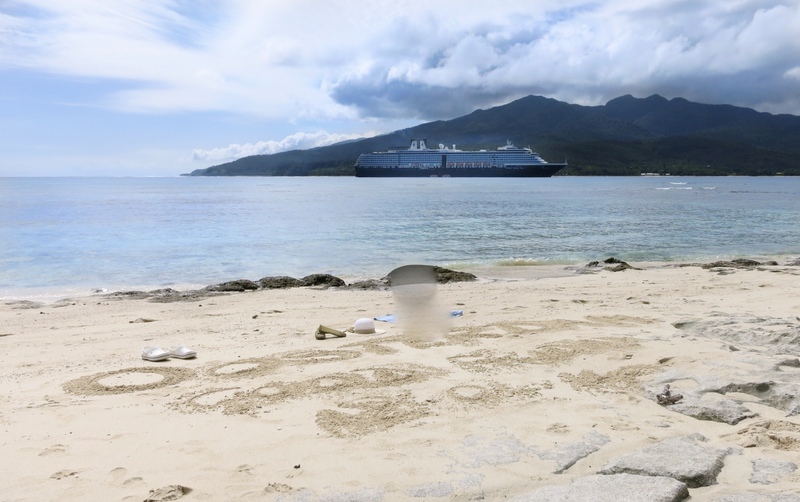 Walking along the beach, on the way back to the landing to catch the tender back to the ship, we came across this sight. A Police Boat was preparing to launch itself from off the beach, a few women and kids hopped aboard, and along with the two cops cast off. I noticed that they hadn't started their outboard motor prior to casting off…. a no-no as you mariners would know. When they were 20 metres offshore, they lowered the outboard and attempted to start it, but without much success. 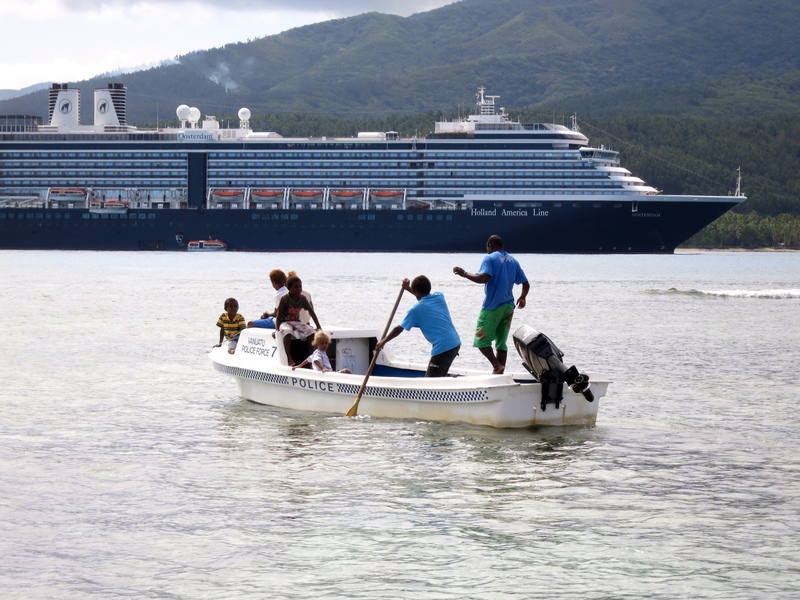 By this time they were being carried towards the reef and trouble….. then one of the cops hurriedly produced a long oar, and began to furiously paddle the boat away from danger…they did eventually get the motor started, but it took them quite a while…. hilarious to watch. 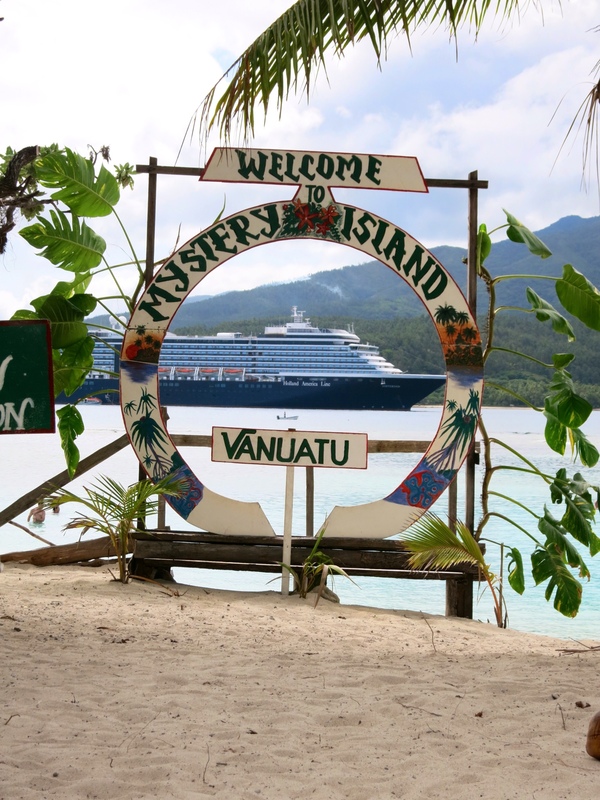 Goodbye Mystery Island, and our next stop is Port Vila where we arrive tomorrow morning. A really Good Friday it was too!